Storage Quality of Service (QoS) in Windows Server 2016 provides a way to centrally monitor and manage storage performance for virtual machines using Hyper-V and the Scale-Out File Server roles. The feature automatically improves storage resource fairness between multiple virtual machines using the same file server cluster and allows policy-based minimum and maximum performance goals to be configured in units of normalized IOPs. Mitigate noisy neighbor issues. By default, Storage QoS ensures that a single virtual machine cannot consume all storage resources and starve other virtual machines of storage bandwidth. Manage Storage I/O per workload business needs Storage QoS policies define performance minimums and maximums for virtual machines and ensures that they are met. This provides consistent performance to virtual machines, even in dense and overprovisioned environments. If policies cannot be met, alerts are available to track when VMs are out of policy or have invalid policies assigned. This document outlines how your business can benefit from the new Storage QoS functionality. It assumes that you have a previous working knowledge of Windows Server, Windows Server Failover Clustering, Scale-Out File Server, Hyper-V, and Windows PowerShell. This section describes the requirements for using Storage QoS, an overview of a software-defined solution using Storage QoS, and a list of Storage QoS related terminologies. For Storage QoS, the Failover Cluster is required on Storage servers, but the compute servers are not required to be in a failover cluster. All servers (used for both Storage and Compute) must be running Windows Server 2016. If you do not have a Scale-Out File Server cluster deployed for evaluation purposes, for step by step instructions to build one using either existing servers or virtual machines, see Windows Server 2012 R2 Storage: Step-by-step with Storage Spaces, SMB Scale-Out and Shared VHDX (Physical). Failover Cluster is required. All servers must be running the same version of Windows Server 2016. Storage Quality of Service is built into the Microsoft software-defined storage solution provided by Scale-Out File Server and Hyper-V. The Scale-Out File Server exposes file shares to the Hyper-V servers using the SMB3 protocol. A new Policy Manager has been added to the File Server cluster, which provides the central storage performance monitoring. As Hyper-V servers launch virtual machines, they are monitored by the Policy Manager. The Policy Manager communicates the Storage QoS policy and any limits or reservations back to the Hyper-V server, which controls the performance of the virtual machine as appropriate. 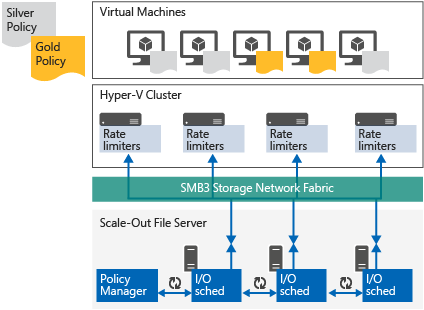 When there are changes to Storage QoS policies or to the performance demands by virtual machines, the Policy Manager notifies the Hyper-V servers to adjust their behavior. This feedback loop ensures that all virtual machines VHDs perform consistently according to the Storage QoS policies as defined. Normalized IOPs All of the storage usage is measured in "Normalized IOPs." This is a count of the storage input/output operations per second. Any IO that is 8KB or smaller is considered as one normalized IO. Any IO that is larger than 8KB is treated as multiple normalized IOs. For example, a 256KB request is treated as 32 normalized IOPs. Windows Server 2016 includes the ability to specify the size used to normalize IOs. On the storage cluster, the normalized size can be specified and take effect on the normalization calculations cluster wide. The default remains 8KB. Flow Each file handle opened by a Hyper-V server to a VHD or VHDX file is considered a "flow". If a virtual machine has two virtual hard disks attached, it will have 1 flow to the file server cluster per file. If a VHDX is shared with multiple virtual machines, it will have 1 flow per virtual machine. InitiatorName Name of the virtual machine that is reported to the Scale-Out File Server for each flow. InitiatorID An identifier matching the virtual machine ID. This can always be used to uniquely identify individual flows virtual machines even if the virtual machines have the same InitiatorName. Policy Storage QoS policies are stored in the cluster database, and have the following properties: PolicyId, MinimumIOPS, MaximumIOPS, ParentPolicy, and PolicyType. PolicyId Unique identifier for a policy. It is generated by default, but can be specified if desired. MinimumIOPS Minimum normalized IOPS that will be provided by a policy. Also known as "Reservation". MaximumIOPS Maximum normalized IOPS that will be limited by a policy. Also known as "Limit". Aggregated A policy type where the specified MinimumIOPS & MaximumIOPS and Bandwidth are shared among all flows assigned to the policy. All VHD's assigned the policy on that storage system have a single allocation of I/O bandwidth for them to all share. Dedicated A policy type where the specified Minimum & MaximumIOPs and Bandwidth are managed for individual VHD/VHDx. This section describes how to enable the new Storage QoS feature and how to monitor storage performance without applying custom policies. This section discusses how to enable Storage QoS on either a new or an existing Failover Cluster and Scale-Out File Server that is running Windows Server 2016. If you have configured a new Failover Cluster and configured a Cluster Shared Volume(CSV) on Windows Server 2016, then the Storage QoS feature will be set up automatically. After you have created a Failover Cluster and configured a CSV disk, , Storage QoS Resource is displayed as a Cluster Core Resource and visible in both Failover Cluster Manager and Windows PowerShell. The intent is that the failover cluster system will manage this resource and you should not have to do any actions against this resource. We display it in both Failover Cluster Manager and PowerShell to be consistent with the other failover cluster system resources like the new Health Service. Use the following PowerShell cmdlet to view the status of Storage QoS Resource. PS C:\> Get-ClusterResource -Name "Storage Qos Resource"
The Hyper-V role in Windows Server 2016 has built-in support for Storage QoS and is enabled by default. You can manage Storage QoS policies and monitor flows from compute hosts using the Remote Server Administration Tools. These are available as optional features on all Windows Server 2016 installations, and can be downloaded separately for Windows 10 at the Microsoft Download Center website. The RSAT-Clustering optional feature includes the Windows PowerShell module for remote management of Failover Clustering, including Storage QoS. The RSAT-Hyper-V-Tools optional feature includes the Windows PowerShell module for remote management of Hyper-V.
You will need some virtual machines stored on the Scale-Out File Server with relevant workloads. For some tips in how to simulate load and do some stress testing, see the following page for a recommended tool (DiskSpd) and some example usage: DiskSpd, PowerShell and storage performance: measuring IOPs, throughput and latency for both local disks and SMB file shares. The example scenarios shown in this guide includes five virtual machines. BuildVM1, BuildVM2, BuildVM3 and BuildVM4 are running a desktop workload with low to moderate storage demands. TestVm1 is running an online transaction processing benchmark with high storage demand. How to query flows using the Get-StorageQosFlow cmdlet. How to view performance for a volume using the Get-StorageQosVolume cmdlet. The Get-StorageQosFlow cmdlet shows all current flows initiated by Hyper-V servers. All data is collected by the Scale-Out File Server cluster, hence the cmdlet can be used on any node in the Scale-Out File Server cluster, or against a remote server using the -CimSession parameter. The following sample command shows how to view all files opened by Hyper-V on server using Get-StorageQoSFlow. The following sample command is formatted to show virtual machine name, Hyper-V host name, IOPs, and VHD file name, sorted by IOPS. The following sample command shows how to filter flows based on InitiatorName to easily find the storage performance and settings for a specific virtual machine. InsufficientThroughput- A policy is applied, but the Minimum IOPs cannot be delivered. This can happen if the minimum for a VM, or all VMs together, are more than the storage volume can deliver. UnknownPolicyId - A policy was assigned to the virtual machine on the Hyper-V host, but is missing from the file server. This policy should be removed from the virtual machine configuration, or a matching policy should be created on the file server cluster. Storage performance metrics are also collected on a per-storage volume level, in addition to the per-flow performance metrics. This makes it easy to see the average total utilization in normalized IOPs, latency, and aggregate limits and reservations applied to a volume. This section describes how to create Storage QoS policies, apply these policies to virtual machines, and monitor a storage cluster after policies are applied. Storage QoS policies are defined and managed in the Scale-Out File Server cluster. You can create as many policies as needed for flexible deployments (up to 10,000 per storage cluster). Each VHD/VHDX file assigned to a virtual machine may be configured with a policy. Different files and virtual machines can use the same policy or they can each be configured with separate policies. If multiple VHD/VHDX files or multiple virtual machines are configured with the same policy, they will be aggregated together and will share the MinimumIOPS and MaximumIOPS fairly. If you use separate policies for multiple VHD/VHDX files or virtual machines, the minimum and maximums are tracked separately for each. If you create multiple similar policies for different virtual machines and the virtual machines have equal storage demand, they will receive a similar share of IOPs. If one VM demands more and the other less, then IOPs will follow that demand. There are two types of policies: Aggregated (previously known as SingleInstance) and Dedicated (previously known as MultiInstance). Aggregated policies apply maximums and minimum for the combined set of VHD/VHDX files and virtual machines where they apply. In effect, they share a specified set of IOPS and bandwidth. Dedicated policies apply the minimum and maximum values for each VHD/VHDx, separately. This makes it easy to create a single policy that applies similar limits to multiple VHD/VHDx files. For instance, if you create a Aggregated policy with a minimum of 300 IOPs and a maximum of 500 IOPs. If you apply this policy to 5 different VHD/VHDx files, you are making sure that the 5 VHD/VHDx files combined will be guaranteed at least 300 IOPs (if there is demand and the storage system can provide that performance) and no more than 500 IOPs. If the VHD/VHDx files have similar high demand for IOPs and the storage system can keep up, each VHD/VHDx files will get about 100 IOPs. However, if you create a Dedicated policy with similar limits and apply it to VHD/VHDx files on 5 different virtual machines, each virtual machine will get at least 300 IOPs and no more than 500 IOPs. If the virtual machines have similar high demand for IOPs and the storage system can keep up, each virtual machine will get about 500 IOPs. . If one of the virtual machines has multiple VHD/VHDx files with the same MulitInstance policy configured, they will share the limit so that the total IO from the VM from files with that policy will not exceed the limits. Hence, if you have a group of VHD/VHDx files that you want to exhibit the same performance characteristics and you don't want the trouble of creating multiple, similar policies, you can use a single Dedicated policy and apply to the files of each virtual machine. Keep the number of VHD/VHDx files assigned to a single Aggregated policy to 20 or less. This policy type was meant to do aggregation with a few VMs on a cluster. Next, apply it to the appropriate virtual machines' hard disk drives on the Hyper-V server. Note the PolicyId from the previous step or store it in a variable in your scripts. Use Get-StorageQosFlow PowerShell cmdlet to confirm that the MinimumIOPs and MaximumIOPs have been applied to the appropriate flows as shown in the following example. On the Hyper-V server, you can also use the provided script Get-VMHardDiskDrivePolicy.ps1 to see what policy is applied to a virtual hard disk drive. Get-StorageQosPolicy lists all configured policies and their status on a Scale-Out File Server. Status can change over time based on how the system is performing. Ok - All flows using that policy are receiving their requested MinimumIOPs. Aggregated policies may be used if you want multiple virtual hard disks to share a single pool of IOPs and bandwidth. For example, if you apply the same Aggregated policy to hard disks from two virtual machines, the minimum will be split between them according to demand. Both disks will be guaranteed a combined minimum, and together they will not exceed the specified maximum IOPs or bandwidth. The same approach could also be used to provide a single allocation to all VHD/VHDx files for the virtual machines comprising a service or belonging to a tenant in a multihosted environment. There is no difference in the process to create Dedicated and Aggregated policies other than the PolicyType that is specified. Each virtual hard disk will have the MinimumIOPs and MaximumIOPs and MaximumIobandwidth value adjusted based on its load. This ensures that the total amount of bandwidth used for the group of disks stays within the range defined by policy. In the example above, the first two disks are idle, and the third one is allowed to use up to the maximum IOPs. If the first two disks start issuing IO again, then the maximum IOPs of the third disk will be lowered automatically. The properties of Name, MinimumIOPs, MaximumIOPs, and MaximumIoBandwidthcan be changed after a policy is created. However, the Policy Type (Aggregated/Dedicated) cannot be changed once the policy is created. This section describes how to find virtual machines with invalid Storage QoS policies, how to recreate a matching policy, how to remove a policy from a virtual machine, and how to identify virtual machines that do not meet the Storage QoS policy requirements. If a policy is deleted from the file server before it's removed from a virtual machine, the virtual machine will keep running as if no policy were applied. The status for the flows will now show "UnknownPolicyId"
Finally, verify that it was applied. If the policy was removed intentionally, or if a VM was imported with a policy that you don't need, it may be removed. Once the PolicyId is removed from the virtual hard disk settings, the status will be "Ok" and no minimum or maximum will be applied. The new Health Service simplifies the monitoring of the Storage Cluster, providing a single place to check for any actionable events in any of the nodes. This section describes how monitor the health of your storage cluster using the debug-storagesubsystem cmdlet. Clustered Storage Spaces also provide information on the health of the storage cluster in a single location. This can help administrators quickly identify current problems in storage deployments and monitor as issues arrive or are dismissed. VMs with invalid policies are also reported through the storage subsystem health monitoring. Here is an example from the same state as described in Finding VMs with invalid policies section of this document. FaultType                 : Storage QoS policy used by consumer does not exist. In this example, a Clustered Storage Space has a virtual disk created as a three-way mirror. A failed disk was removed from the system, but a replacement disk was not added. The storage subsystem is reporting a loss of redundancy with HealthStatus Warning, but OperationalStatus "OK because the volume is still online. successfully repair or regenerate its data. This section includes a sample script showing how common failures can be monitored using WMI script. It's designed as a starting part for developers to retrieve health events in real time. The setting on the VHD/VHDx file that specifies the policy is the GUID of a policy ID. When a policy is created, the GUID can be specified using the PolicyID parameter. If that parameter is not specified, a random GUID is created. Therefore, you can get the PolicyID on the storage cluster where the VMs currently store their VHD/VHDx files and create an identical policy on the destination storage cluster and then specify that it be created with the same GUID. When the VMs files are moved to the new storage clusters, the policy with the same GUID will be in effect. System Center Virtual Machine Manager can be used to apply policies across multiple storage clusters, which makes this scenario much easier. If you have a flow that is hitting a maximum of a policy and you change the policy to either make it higher or lower, and then you immediately determine the latency/IOPS/BandWidth of the flows using the PowerShell cmdlets, it will take up to 5 minutes to see the full effects of the policy change on the flows. The new limits will be in effect within a few seconds, but the Get-StorgeQoSFlow PowerShell cmdlet uses an average of each counter using a 5 minute sliding window. Otherwise, if it was showing a current value and you ran the PowerShell cmdlet multiple times in a row, you may see vastly different values because values for IOPS and latencies can fluctuate significantly from one second to another. In Windows Server 2016 the Storage QoS Policy type names were renamed. The Multi-instance policy type is renamed as Dedicated and Single-instance was renamed as Aggregated. The management behavior of Dedicated policies is also modified - VHD/VHDX files within the same virtual machine that have the same Dedicated policy applied to them will not share I/O allocations. Storage QoS in Windows Server 2016 introduces the ability to specify the maximum bandwidth that the flows assigned to the policy may consume. The parameter when specifying it in the StorageQosPolicy cmdlets is MaximumIOBandwidth and the output is expressed in bytes per second. If both MaximimIops and MaximumIOBandwidth are set in a policy, they will both be in effect and the first one to be reached by the flow(s) will limit the I/O of the flows. Storage QoSin uses normalization of IOPS. The default is to use a normalization size of 8K. Storage QoS in Windows Server 2016 introduces the ability to specify a different normalization size for the storage cluster. This normalization size effects all flows on the storage cluster and takes effect immediately (within a few seconds) once it is changed. The minimum is 1KB and the maximum is 4GB (recommend not setting more than 4MB since it's unusual to have more than 4MB IOs). Something to consider is that the same IO pattern/throughput shows up with different IOPS numbers in the Storage QoS output when you change the IOPS normalization due to the change in normalization calculation. If you are comparing IOPS between storage clusters, you may also want to verify what normalization value each is using since that will effect the normalized IOPS reported. In PowerShell, you can specify the units that a number is expressed in. In the following example, 10MB is used as the maximum bandwidth value. Storage QoS will convert this and save it as bytes per second Hence, 10MB is converted into 10485760 bytes per second. The following example demonstrates how to get the storage clusters IOPS normalization settings (default of 8KB), then set it to 32KB, and then show it again. Note, in this example, specify "32KB", since PowerShell allows specifying the unit instead of requiring the conversion to bytes. The output does show the value in bytes per second.